Radar satellites supply the data used to map sea level and ocean currents. However, up until now, the radar has been ineffective in regions where the oceans are covered by ice. Researchers at the Technical University of Munich (TUM) have now developed a new analysis method to solve this problem. The melting of the polar ice cap would have drastic effects. Sea levels would rise by several meters around the world, impacting hundreds of millions of people who live close to the coasts. "This means one of the most important questions of our time is how climate change is affecting the polar regions," says Dr. Marcello Passaro of the TUM German Geodetic Research Institute. But changes in sea level and ocean currents in the ice-covered regions of the Arctic and Antarctic in particular are very difficult to detect. The reason: The radar signals of existing altimeter satellites are reflected by the ice at the poles. This renders the water underneath the ice invisible. But ocean water also passes through cracks and openings in the permanent ice, reaching the surface. "These patches of water are, however, very small, and the signals are highly distorted by the surrounding ice. Here, standard evaluation methods like those used for measurements made on the open seas are incapable of returning reliable results," Passaro says. Together with an international team, he has now developed a data analysis method that sharpens the focus of the radar. The core of this virtual "contact lens" is the adaptive algorithm called adaptive leading edge subwaveform (ALES+). ALES+ automatically identifies the portion of the radar signal reflected by water and derives sea level values using this information only. This makes it possible to measure the altitude of the ocean water reaching the surface through ice cracks and openings. By comparing several years of measurements, climate researchers and oceanographers can now draw conclusions about changes in sea level and ocean currents. "The special thing about our method is that it is adaptive," Passaro notes. 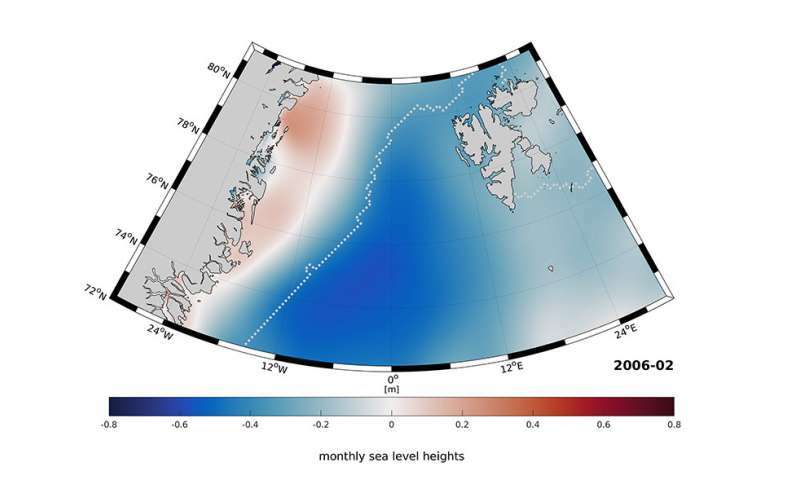 "We can use the same algorithm to measure sea level in both open and ice-covered ocean areas. ALES+ can also be used for coastal waters, lakes and rivers. Here, the signals are highly varied, but always exhibit certain characteristic properties which the system then learns." The scientists were able to use a test scenario in the Greenland Sea to demonstrate that ALES+ returns water levels for ice-covered and open ocean regions that are significantly more precise than the results of previous evaluation methods.